With two weeks left for parents to vote in a Department of Education poll to choose the patron of Galway’s new second-level school, due to open in 2019, local parents advocating for Educate Together have announced a meeting for 25th July at 8pm in Ballybane Community Resource Centre. This meeting is the latest in a series organised by the Galway Educate Together Second Level Startup group (GET2LS) to inform parents about the opportunities offered by the Educate Together model. Following successful public meetings in Oranmore and on the NUI Galway Campus, the group’s third meeting will allow parents on the East side of the city to learn about the Educate Together model, and what a second-level school might look like. As with previous meetings, this meeting will provide information on the inclusive, student-centred, and democratic approach to learning offered by the organisation’s schools at second level. Dr Laura Dooley, Second Level Education Officer with Educate Together, explained at the group’s last meeting in Oranmore how their schools employ tools such as phenomenon-based learning, which foster active learning, drawing teachers together to work in teams, and ensuring that students gain not only subject knowledge but a holistic understanding of topics that span subject areas. As the voting process for Galway’s new school enters its last two weeks, parents are being urged to cast their vote for Educate Together, and to encourage other eligible parents to vote to ensure increased diversity in school options in the region. 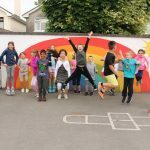 “This competition offers an opportunity for us to diversify the options available to Galway families, and to open the first second-level Educate Together in the west of Ireland,” says GET2LS chair Roisin McManus, noting that by the end of the year Educate Together will be running 13 secondary schools nationwide. The GET2LS campaign has the support of local representatives from across the spectrum. Deputy Hildegard Naughton attended the meeting in Oranmore, while a previous meeting on the NUIG campus was addressed by numerous local representatives, including Mayor Níall McNelis, Ministers Ciaran Cannon and Sean Kyne, TD Hildegard Naughton, and Cllr Frank Fahy. All TDs in Galway West and East have declared their support for the Educate Together campaign, along with many of the declared candidates for the next election. With the current survey of parents so important in deciding patronage, several public representative have urged parents, whatever their plans for their own children’s schooling, to vote for Educate Together in the current competition, to broaden the diversity of schools available in Galway, and ensure that the option is available to those parents who desire it. The new school, due to open in 2019, is a ‘regional solution’ aimed primarily at the Galway city and Oranmore school planning areas, and is intended to meet the increasing demand for second-level education in Galway, with an anticipated enrolment of 1,000. Educate Together is committed to including an Aonad (Irish-language stream) in the school if there is sufficient parental demand. The location of the school will be decided at a later date by the Department. The deadline for parents to vote in the online survey is 31st July. Further information, including a direct link to the survey, is available from GET2LS.org/VOTE. Voting in the DES survey is open to parents of pupils who have recently completed 1st through 5th class (anticipated second-level entry of 2019 to 2023), who live in the Galway city and Oranmore areas.